Malasaña lives in perpetual rebellion. The most avant-garde barrio in Madrid, it’s home to candy-colored buildings and technicolor street art, all drenched in Spanish sunshine. Waking from a late slumber, the neighborhood gently crescendos into joyful chaos, first signaled by the clink of tattooed baristas pouring the trendiest café con leches in the city. 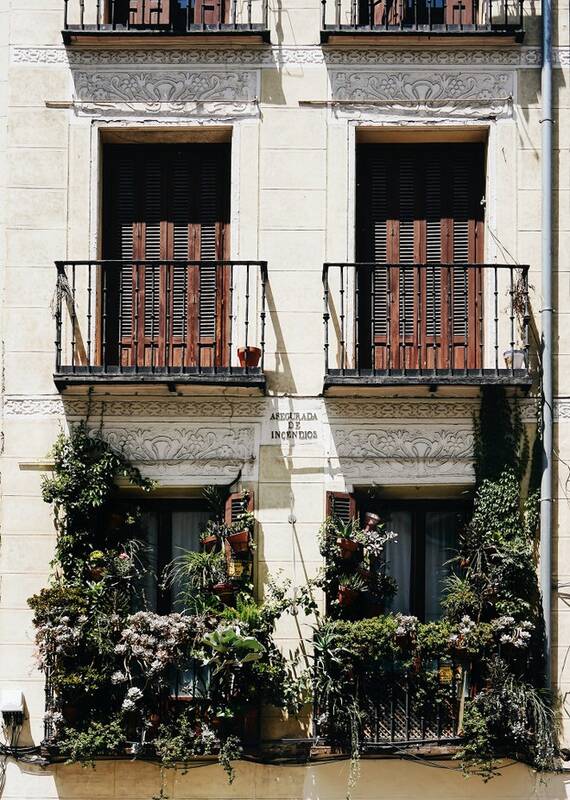 Under a splattering of graffiti, Spanish abuelas sweep their stoops as the sun peeks over wrought iron balconies. These women have always lived here, through the reincarnations of the barrio named for Manuela Malasaña, a 15-year-old girl who defended her honor to the death, with pluck and a pair of scissors, against occupying Napoleonic forces. The young icon imbued her eponymous neighborhood with an edge that’s only ripened over time. Malasaña’s riotous streets gave way to La Movida Madrileña, the 80s countercultural movement that tumbled out of the country’s transition to democracy. The same streets now sometimes garner eye rolls from locals, who may balk at its hipster revolution but lay claim to Malasaña’s enviable bars and boutiques nonetheless. While there are few alluring hotels in Malasaña, neighboring Hotel Urso more than makes up for the dearth of competition as an elegant respite from the delightful mayhem of the neighborhood. A five-minute jaunt from the barrio, its buttercream facade (akin to the most decadent wedding cake) welcomes you to an intimate five-star hotel. From your first step into the former palace, you’ll catch glimmers of its past life in lavish molding and an original mahogany elevator, so precious it’s protected by law. Melt into la vida buena on one of the lobby’s creamy couches with a welcome cocktail. Upstairs, natural light illuminates luxurious rooms with a neutral palette and local touches, like artisan potato chips from La Azucena you’ll snag at the mini bar. For a proper siesta, retreat back downstairs to the sleek, subterranean spa, where you can rest your feet in the hydromassage pool before popping into the steam room. With its bohemian kick, Malasaña is a natural habitat for indie designers. Most shops follow the meandering local schedule, closing between 2:00 and 5:00 p.m. for a siesta before opening up again until 8:00 or 9:00 p.m. Plan a spree accordingly. The petite Hijo de Epigmenio charms you with an enchanting collection of handmade Spanish ceramics and traditional Ikat fabrics from Mallorca. You’ll also want to squeeze a rattan bull into your suitcase from self-taught artisan Javier S. Medina, who weaves awe-inspiring products out of natural materials. A few doors down, El Moderno leans contemporary with clean home accessories and quirky illustrations of the city by local On the other side of the barrio, handmade Spanish hats from designer Irene Obeso Martín, including the perfect wide-brimmed beach hat, line the walls of her lovely atelier Cabeza de Calabaza. To follow in the footsteps of Spain’s royal family, walk down the street with your hatbox to buy a pair of traditional espadrilles (a size down because they do stretch) at Antiqua Casa Crespo, the oldest purveyor in the city. Nearby Magro Cardona will also lure you in with their bright, chunky Spanish sandals, and Lacambra slings handmade leather bags fit for a weekend trip to Ibiza. If you’re a lover of vintage, the shops along Calle de Velarde are not to be missed either, with Magpie Vintage claiming the top prize. Malasaña brings something old and new to the table. You’ll want to eat your way through its storied establishments and newest haunts for the full breadth of the barrio’s local flavor. At La Ardosa, dip under the iconic bar to grab a seat in the main dining area. Sip on a glass of Vermouth poured from the tap and nibble on a pincho or slice of tortilla and a bowl of Salmorejo, the creamier cousin of gazpacho. Always make time for decadent churros and thick hot chocolate at La Churrería Madrid 1883, which holds the holy honor of being the oldest churrería in this capital city. Hotel Urso also houses a wonderful restaurant, Media Racíon, guided by the same family that runs the beloved Madrilēnos establishment Cuenllas. Their modern interpretation of Spanish delights is worth an indulgent dinner. Restaurante Navaja, with its tapas fusion menu of standouts like signature Spanish razor clams doused in peanut sauce (navaja means razor clam in Spanish) and bao buns stuffed with Iberian pork shoulder, will also leave you licking your fingers. A conscious break from tapas is sometimes required, and Misión Café fulfills that purpose in style. 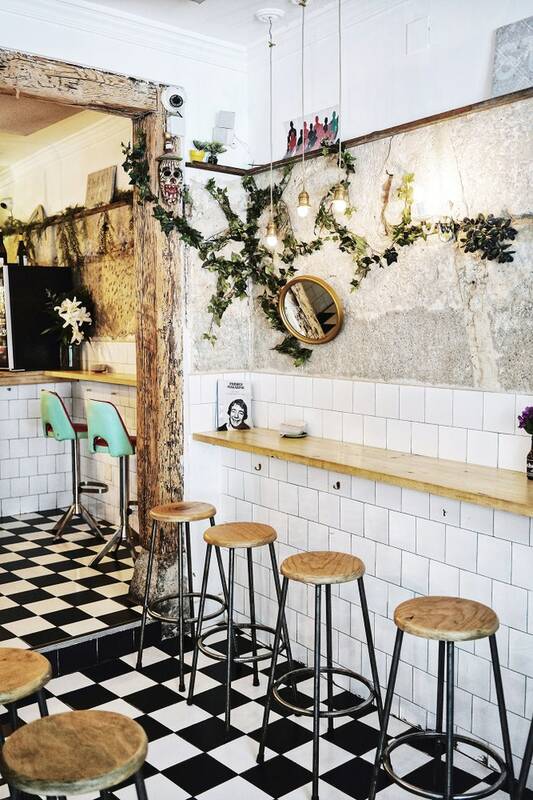 This Scandinavian-inspired coffee shop serves light dishes, including spicy chickpeas on toast with a dollop of sour cream. Panicbakery delivers with the crustiest bread in Madrid from masa madre or Spanish sourdough baked right next to Quesería Cultivo, a haven of small-batch local cheeses. Sniff out a show-stopping bread and cheese combination before retiring to Plaza de Guardias de Corps, the small square across from the Condé Duque cultural center, for a bench picnic. Brimming with bars, plazas, and clubs, Malasaña is nothing if not a late-night hot spot. For drinks, prioritize tapas bar La Ardosa, and from there, make your way to Tipos Infames, where you can swirl eclectic wines while browsing independent books. 1862 Dry Bar, the most revered cocktail bar in the neighborhood, knocks out the best gin and tonics. Or you can post up at Kikekeller, a designer furniture store and gallery that transforms into a bar serving craft cocktails and beer in the evening. In Madrid, the night goes until 6:00 a.m.—plan on watching the sunrise while walking back from your club of choice. OchoYMedio, an indie dream set to electro-pop hits, or La Vía Láctea, which harkens back to Malasaña’s grunge heyday, are both favorites with distinctly different vibes.